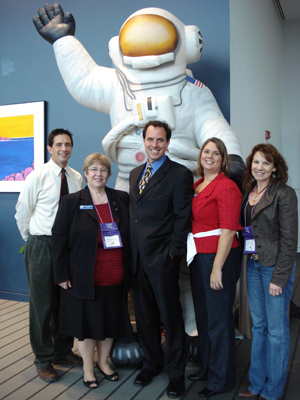 The NASA eClips™ educators travel around the country introducing teachers to new and innovative ways to inspire students using the latest science and innovation developed at NASA. Pictured are some of our team members: Mark Clemente, Becky Jaramillo, Jim Egenrieder, Shannon Verstynen, Cathy Scott, and Sharon Bowers (np). We will keep you updated on our travels and would love to hear from you. We are very interested in hearing about the creative ways that you are using the NASA eClips products. Thank you for taking the time to talk to us today down here in North Carolina. I really appreciate all the resources you had to share! One great video clip I found was titled “Real World: Using Lunar Soil to Make Oxygen”. During my astronomy units, one of the things we talk about is the requirements to support life and I have the students build habitation stations that could be used to sustain life on the moon. I think this video clip would be a great introduction to that project! Previous Previous post: How are you using NASA eClips™ in your classroom?